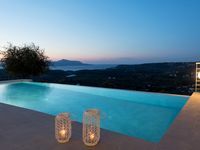 Property 12: Sea View Breathtaking: Prinolithos Villa. Reduced Prices between June 02 & 23!! Athina House! Amazing views, gym, bicycles, walking distance to tavern! Property 31: Athina House! Amazing views, gym, bicycles, walking distance to tavern! Property 37: Large private apartment in a traditional Greek village with stunning views. Property 44: Fully Equipped Beachfront Apartment In Almirida For Up To 5 Persons.